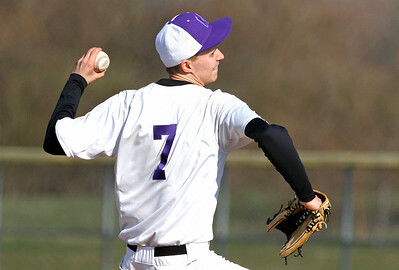 H. Rick Bamman - hbamman@shawmedia.com Hampshire's relief pitcher Pawel Barnas (cq) throws in the fifth inning against Crystal Lake Central on Thursday, April 14, 2016. Hampshire won 6-4. 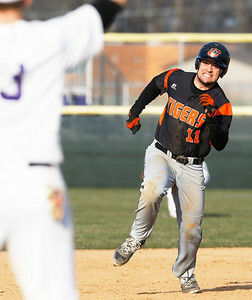 H. Rick Bamman - hbamman@shawmedia.com Crystal Lake Central's Frank Berg charges into third after hitting a triple in the fifth inning on Thursday, April 14, 2016. Crystal Lake South lost to Hamphire 6-4. 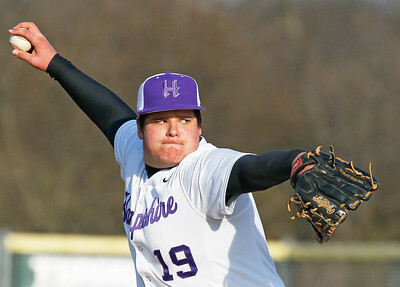 H. Rick Bamman - hbamman@shawmedia.com Hampshire starting pitcher Bryan Diete thows at home against Crystal Lake Central on Thursday, April 14, 2016. Hampshire won 6-4. H. Rick Bamman - hbamman@shawmedia.com Crystal Lake Central's Richie Hintz fields a Hampshire ground ball to third base in the fourth inning on Thursday, April 14, 2016 in Hamphire. Crystal Lake Central lost to Hampshire 6-4. H. Rick Bamman - hbamman@shawmedia.com Crystal Lake Central's Logan Mensching is tagged out at the plate by and Hampshire catcher Matthew Wians in the first inning on Thursday, April 14, 2016. Hampshire won 6-4. 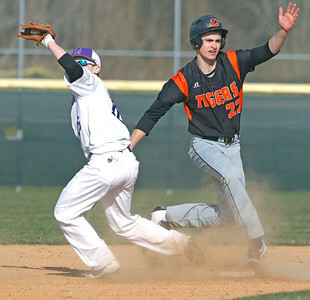 H. Rick Bamman - hbamman@shawmedia.com Crystal Lake Central's Camden Nisenson is called safe at second after Hampshire's short stop Kevin Michaelsen missed the tag in the second inning on Thursday, April 14, 2016. Hampshire went on to win 6-4. H. Rick Bamman - hbamman@shawmedia.com Jake Trevino (Clark) recovers a foul ball in the first inning against Crystal Lake Central on Thursday, April 14, 2016. During Hampshire baseball games, when a foul ball flies out of play, coach John Sarna yells out, "Lewis and Clark. Get on that." Two bench players jog out of the dugout and go hunting through the woods in search of the lost baseball. H. Rick Bamman - hbamman@shawmedia.com Hampshire baseball players Jake Trevino (Clark) (left) and Anthony Chomenko (backup Lewis) emerge from a wooded area south of the field after recovering foul balls during the fouth inning against Crystal Lake Central on Thursday, April 14, 2016. During Hampshire baseball games, when a foul ball flies out of play, coach John Sarna yells out, "Lewis and Clark. Get on that." 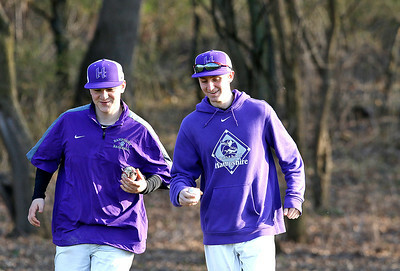 Two bench players jog out of the dugout to search through the woods in search of baseballs. 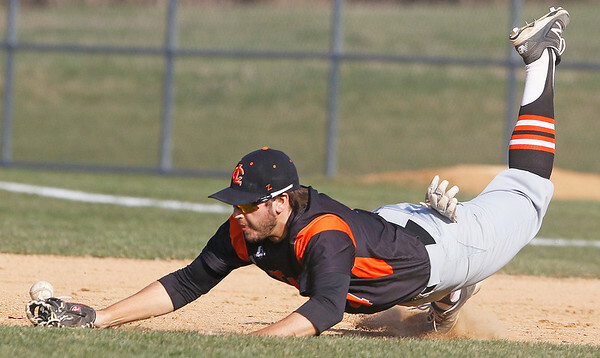 H. Rick Bamman - hbamman@shawmedia.com Crystal Lake Central's first baseman Luke Tevyaw dives for but misses a Hampshire grounder in the second inning on Thursday, April 14, 2016. Hampshire won 6-4. Crystal Lake Central's Camden Nisenson is called safe at second after Hampshire's short stop Kevin Michaelsen missed the tag in the second inning on Thursday, April 14, 2016. Hampshire went on to win 6-4.